Lorenzo has been at the forefront of wireless technology and innovation for 15 years. He joined Qualcomm in 2000 and has been with the company since then, covering a variety of roles related to wireless communication, including research and system design, government affairs, product management and technical standardization. He currently leads a team of engineers across three continents driving Qualcomm’s activities in 3GPP, the standards body designing technologies for 2G, 3G, 4G (and in the future 5G). He is based in Rome, and travels frequently to California, where he has lived for a number of years. 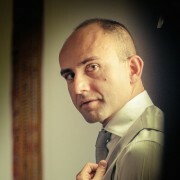 Lorenzo holds university degrees in Electrical Engineering from the Turin Polytechnic, in Telecommunication from the Eurecom Institute, France, and in Philosophy from the Rome University. He is the author or co-author of over 40 approved patents.